Source: 1800 United States Federal Census. Second Census of the United States. 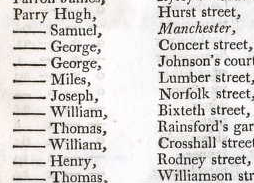 1806 poll register for Thomas Parry, Shipwright, living on Williamson Street in Liverpool. Image 1916, page 32. 1810 Coolbaugh Moses Year: 1810; Census Place: Wyasox, Luzerne, Pennsylvania; Roll: 49; Page: 704; Image: 0193675. Third Census of the United States, 1810. (NARA microfilm publication M252, 71 rolls). Bureau of the Census, Record Group 29. National Archives, Washington, D.C.
1820 Coolbaugh John and Elizabeth household. 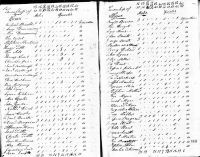 1820 U S Census; Census Place: Towanda, Bradford, Pennsylvania; Page: 115; NARA Roll: M33_98; Image: 130. Fourth Census of the United States, 1820. (NARA microfilm publication M33, 142 rolls). Records of the Bureau of the Census, Record Group 29. National Archives, Washington, D.C. Source: 1820 United States Federal Census. Fourth Census of the United States. 1820 Ennis Levi and Lolly household 1820 U S Census; Census Place: Wysox, Bradford, Pennsylvania; Page: 118; NARA Roll: M33_98; Image: 133. Fourth Census of the United States, 1820. (NARA microfilm publication M33, 142 rolls). Records of the Bureau of the Census, Record Group 29. National Archives, Washington, D.C.
1830 Ennis Levi and Lolly household 1830 US Census; Census Place: Wysox, Bradford, Pennsylvania; Page: 57; NARA Series: M19; Roll Number: 145. Fifth Census of the United States, 1830. (NARA microfilm publication M19, 201 rolls). Records of the Bureau of the Census, Record Group 29. National Archives, Washington, D.C. Source: 1830 United States Federal Census. Fifth Census of the United States. 1850 Ennes Levi and Lolly household Census Place: Standing Stone, Bradford, Pennsylvania; Roll: M432_757; Page: 333A; Image: 415. 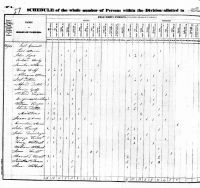 Seventh Census of the United States, 1850; (National Archives Microfilm Publication M432, 1009 rolls); Records of the Bureau of the Census, Record Group 29; National Archives, Washington, D.C.
Year: 1850; Census Place: Durell, Bradford, Pennsylvania; Roll: M432_757; Page: 250B; Image: 254. 1850 United States Census: Coolbaugh William and Hannah households. Louisa living at home with her infant son. 1851 Census Edward Parry. Census Returns of England and Wales, 1851. Kew, Surrey, England: The National Archives of the UK (TNA): Public Record Office (PRO), 1851. Class: HO107; Piece: 2172; Folio: 101; Page: 35; GSU roll: 87162-87164. 1851 England census. Daniel Massey and Elizabeth Gibson household. 1857 Census Lübeck Germany Pump family Ludwig-Friederich and Johanna, four children, one of which was Pauline Pump. Note these are not the names of the parents listed on her marriage banns. Archiv der Hansestadt Lübeck; Statistisches Landesamt: Zähllisten der Volkszählung, 1857; Volume: Band 4. Marien-Quartier. 1860 Coolbaugh John household. Year: 1860; Census Place: Standing Stone, Bradford, Pennsylvania; Roll: M653_1081; Page: 778; Image: 230. 1860 U.S. census, population schedule. NARA microfilm publication M653, 1,438 rolls. Washington, D.C.: National Archives and Records Administration, n.d.
living with her brother Abram on his farm, Keeping house. Her daughter Harriet 7y/o & son Dayton 10y/o are also living there. Her father Henry has the next door farm. 1861 Census Edward Parry. Census Returns of England and Wales, 1861. Kew, Surrey, England: The National Archives of the UK (TNA): Public Record Office (PRO), 1861. Class: RG 9; Piece: 2966; Folio: 11; Page: 15; GSU roll: 543057. 1861 Census Henry Rixon. Census Returns of England and Wales, 1861. Kew, Surrey, England: The National Archives of the UK (TNA): Public Record Office (PRO), 1861. Class: RG 9; Piece: 863; Folio: 38; Page: 8; GSU roll: 542712. 1861 Census Mary Knowles. Census Returns of England and Wales, 1861. Kew, Surrey, England: The National Archives of the UK (TNA): Public Record Office (PRO), 1861. Class: RG 9; Piece: 2958; Folio: 24; Page: 48; GSU roll: 543056. 1861 Census. Chadwick Knowles. Census Returns of England and Wales, 1861. Kew, Surrey, England: The National Archives of the UK (TNA): Public Record Office (PRO), 1861. RG 9; Piece: 2957; Folio: 44; Page: 25; GSU roll: 543055. 1870 Bjick Carl and Augusta household. Chicago Ward 15, Cook, Illinois; Roll: M593_208; Page: 751A; Image: 315. Microfilm publication M593, 1,761 rolls. Washington, D.C.: National Archives and Records Administration, n.d.
1870 Ennis BW and Louisa (Coolbaugh) household, Census Place: Wysox, Bradford, Pennsylvania; Roll: M593_1312; Page: 695A; Image: 666. 1870 U.S. census, population schedules. NARA microfilm publication M593, 1,761 rolls. Washington, D.C.: National Archives and Records Administration, n.d.
1871 Census Chadwick Knowles. Census Returns of England and Wales, 1871. Kew, Surrey, England: The National Archives of the UK (TNA): Public Record Office (PRO), 1871. Class: RG10; Piece: 4048; Folio: 72; Page: 24; GSU roll: 846338. 1871 Census Edward Parry. Census Returns of England and Wales, 1871. Kew, Surrey, England: The National Archives of the UK (TNA): Public Record Office (PRO), 1871. Class: RG10; Piece: 4057; Folio: 107; Page: 18; GSU roll: 846342. 1871 Census Lu?beck Germany. Here Anna Christina Pauline Pump is living alone as a border. 1871 England Census. Daniel Massey and Elizabeth Gibson household. 1880 Ennis, Benjamin and Louisa household. Nicholson, Wyoming, Pennsylvania; Roll: 1205; Family History Film: 1255205; Page: 115C; Enumeration District: 210. Tenth Census of the United States, 1880. (NARA microfilm publication T9, 1,454 rolls). Records of the Bureau of the Census, Record Group 29. National Archives, Washington, D.C. Her son Dayton, her daughter Harriet, her sister Rachel are living with her. Her son Dayton works as a Farm Laborer and is noted as Head of Household. 1881 Census. Edward Parry. Census Returns of England and Wales, 1881. Kew, Surrey, England: The National Archives of the UK (TNA): Public Record Office (PRO), 1881. Class: RG11; Piece: 4012; Folio: 38; Page: 2; GSU roll: 1341958. 1881 Harry Parry and Mary household. Census Returns of England and Wales, 1881. Kew, Surrey, England: The National Archives of the UK (TNA): Public Record Office (PRO), 1881. Class: RG11; Piece: 3969; Folio: 18; Page: 5; GSU roll: 1341948. 1900 Bick Hermann and Helene household, Chicago Ward 25, Cook, Illinois; Roll: 275; Page: 2B; Enumeration District: 750 United States of America, Bureau of the Census. Twelfth Census of the United States, 1900. Washington, D.C.: National Archives and Records Administration, 1900. T623, 1854 rolls. 1900 Bjick Carl and Augusta household. 1900; Census Place: Chicago Ward 25, Cook, Illinois; Roll: 275; Page: 14B; Enumeration District: 754; FHL microfilm: 1240275. United States of America, Bureau of the Census. Twelfth Census of the United States, 1900. Washington, D.C.: National Archives and Records Administration, 1900. T623, 1854 rolls. 1900 Ennis Oscar and Mary household Elmira NY Elmira Ward 11, Chemung, New York; Roll: 1016; Page: 4B; Enumeration District: 33; FHL microfilm: 1241016. United States of America, Bureau of the Census. Twelfth Census of the United States, 1900. Washington, D.C.: National Archives and Records Administration, 1900. T623, 1854 rolls.